Do you ever have those moments where you want to pop some earbuds in and strut around a city to your favorite song, feeling like you’re in a ’90s movie montage? (Please say yes, and leave song recommendations in the comments.) That was every moment of shopping in Paris for me. I went with a budget and a list of things I was looking for, a list of things to absolutely not buy (for the love, Maegan, NO MORE BLACK OR WHITE T-SHIRTS), while, of course, leaving room for those unplanned pieces you had no clue you needed until you met them. The magic of shopping while traveling is that you don’t have to spend a lot of money to take home treasures. The inspiration of seeing people that are different from me in other parts of the world gives me a perspective that leaves me (and my closet) better for it. 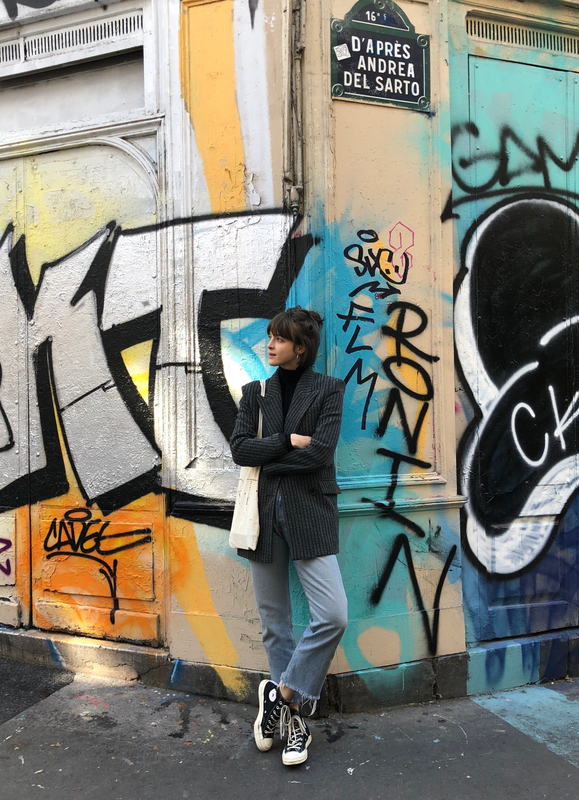 But enough of my travel rhetoric, here are five things I did not buy in Paris, and maybe some things I did… . One of the items at the top of my list was a coat. Maybe it’s because I grew up in Texas, but coats bewilder me. 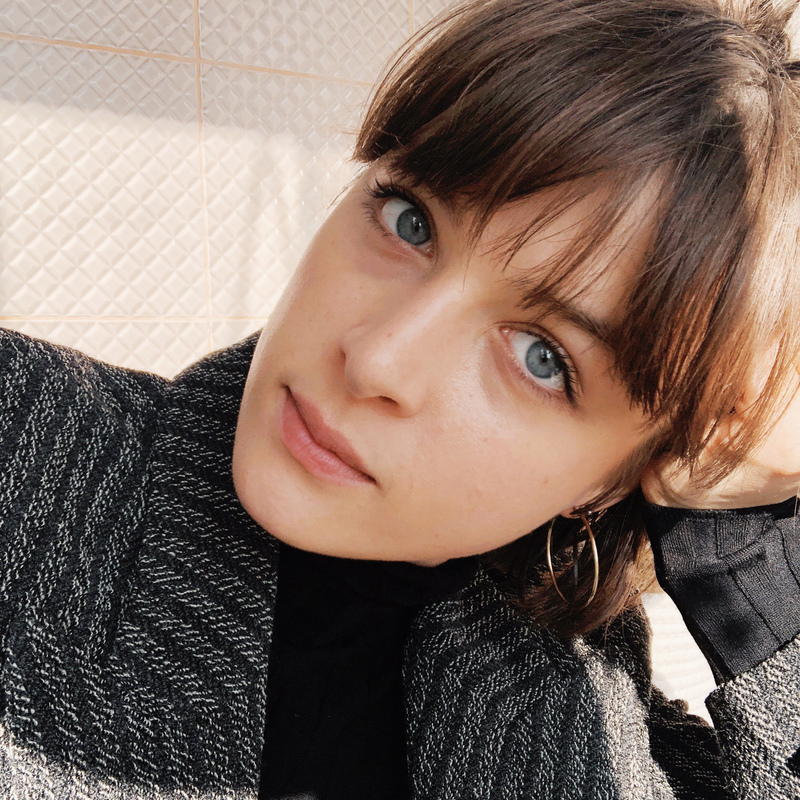 Jackets are great, jackets I love, jackets are an accessory — I get jackets. It’s when it’s actually cold outside and I need the top layer to function in its intended role of shielding me from the elements that I surrender to my boring black Patagonia that I bought on clearance. Don’t get me wrong, I’m grateful to have a coat, but sometimes coats feel like the boring Tupperware container I have to put my lusciously crafted cheesecake in to get it to the party. (The cheesecake being my outfit, obviously.) What I’m trying to say is coats are hard for me and I know I’m not alone. They need to be functional, but I don’t want to give up on the fun factor i.e. FUNctional, if you will. Enter this giant REI sleeping bag of a coat… . Puff Daddy sleeping bag coat. Like an arctic snuggie, this made me feel equal parts fashionable rapper/’90s boy band member/third grader in hand-me-downs, which might actually be the trifecta of my personal style. 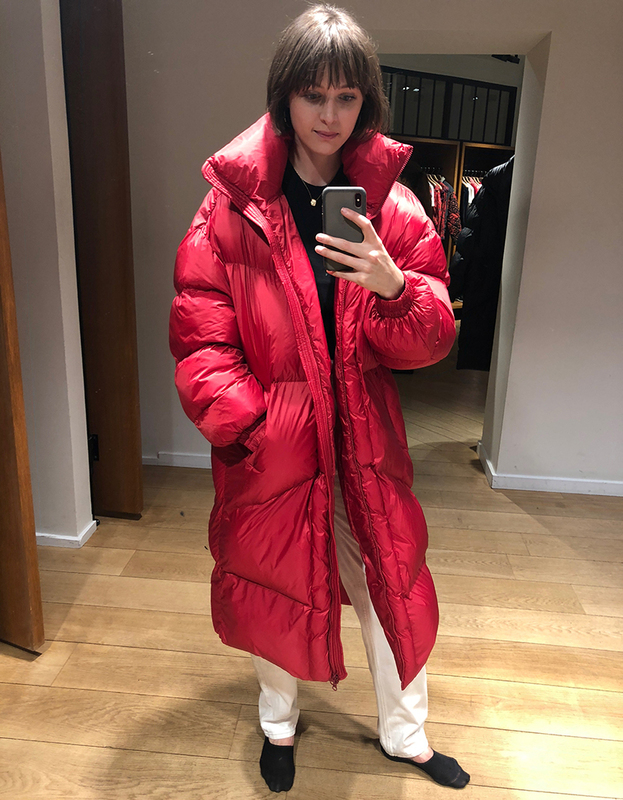 All that being said, I left it behind and later scored a less oversized, but still pretty dope red puffer at Zara for 60 euros. I consider this a win. Speaking of things that bewilder me: lady blouses. You know the sort — something silky or ruffle-y or just dressier than a t-shirt — fancy. I’m a t-shirt gal through and through, though I’m happy to jive with turtlenecks and sweaters when the temps drop. However, as I’ve gotten older and have “nice” dates or dinners to go to, I find myself standing in front of my closet, wishing I had something that feels more dressed up than a tee, that still feels like me. 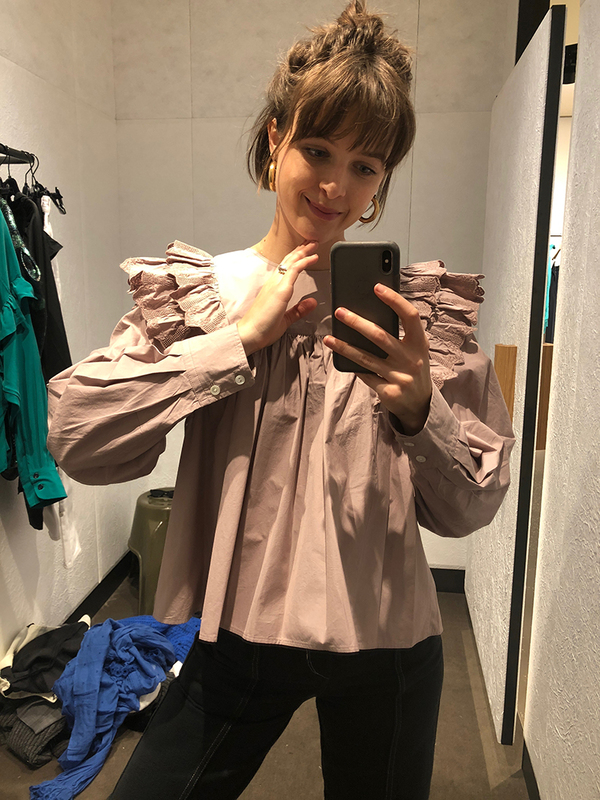 I figured if I could find a lady blouse that fits my “effortless” (zero effort preferably) tendencies, Paris would be the place. While I did find a couple that went home with me, this one did not. Behold, the lady blouse that made me feel like a baby napkin, albeit a fancy one. 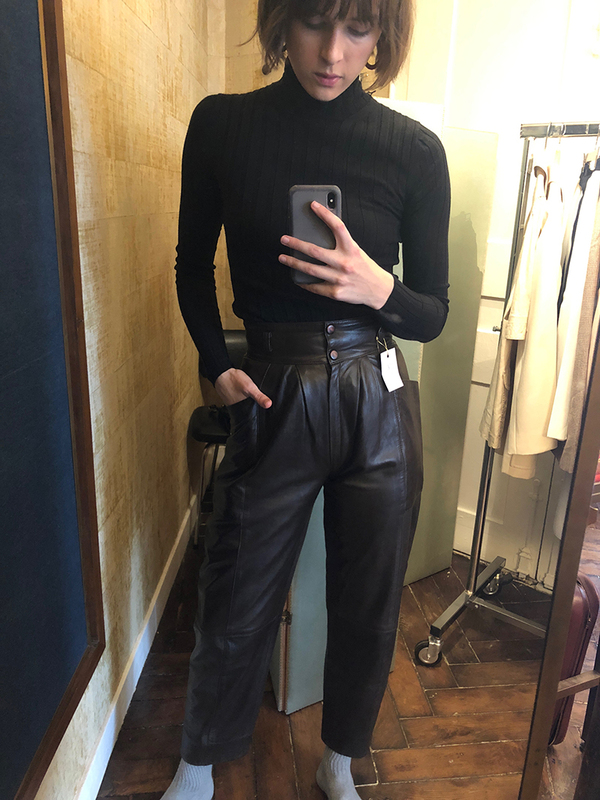 Does everyone need leather trousers? I don’t know, but for me, the answer was a resounding “yes” about five days into our trip, after seeing a dozen or so women of various ages looking really, really cool and pulled together sporting said trousers. 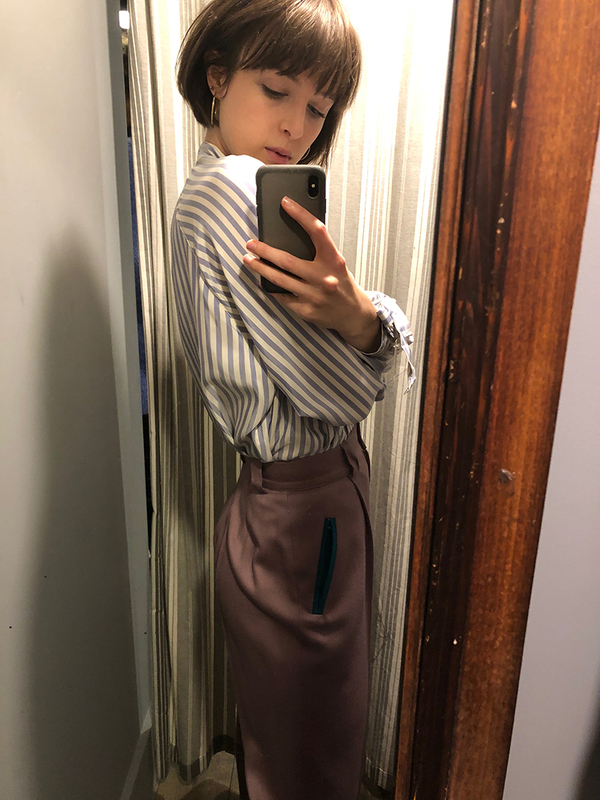 I also kept seeing them at vintage shops and thought to myself “this is a ‘when in Paris’ situation.” I tried this pair on in a more upscale vintage shop where they were priced at 120 euros. I walked away. Next day, I went into one of those dingy treasure caves of a shop where you stuff things in a sack and they charge you by the kilo. 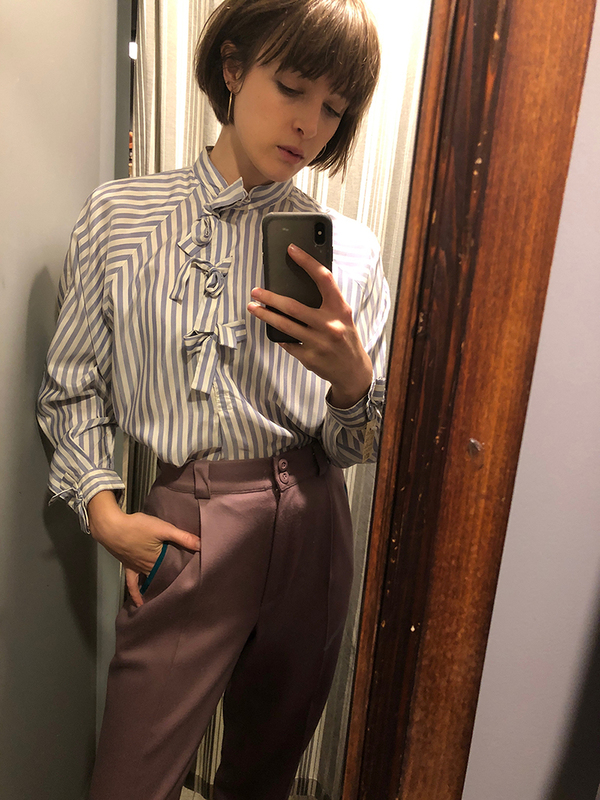 I scored an amazing pair of vintage trousers very similar to the upscale pair for 20 euros. I’ve yet to actually wear them, but I feel chic just thinking about them. 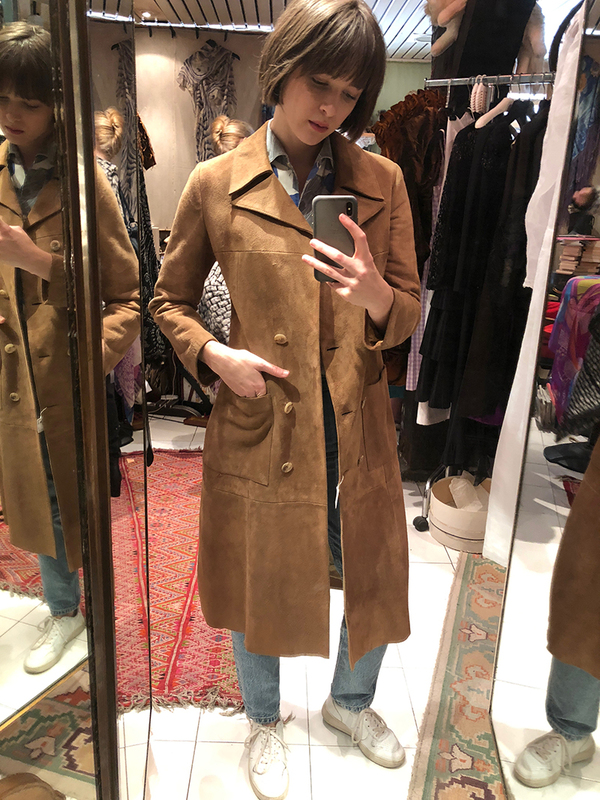 Okay, I’m revisiting the coat category with this suede jacket. I mean, it’s cool and all, but if I’m honest with myself, as much as I appreciate the style of the ’70s, it’s just not my thing. Brown in general makes me feel sad for some reason. I don’t know, my feelings were weird, but basically it did not spark joy. Also, it was missing a button. I decided to be honest with myself and recognize that I’ve never actually mended any item of damaged, vintage clothing I’ve bought. These perfect lilac trousers land me in major regret city every time I think about them. I’m not sure why I didn’t pull the trigger. I think I got intimidated by the teal pocket trim. But instead of wasting tears over diems un-carpe’d, might I draw your attention upwards — and with that, I’ve segued into the bonus portion of this piece. The things I did buy, starting with this lady blouse. It’s everything I wanted in a ladylike top. I will be wearing this with high-waisted straight-leg jeans, heeled boots, and big earrings. Operation fancy is a go. Lilac trousers I didn't buy. Lady blouse I did buy. Remember that giant red puffer coat? Well I didn’t from the moment I laid eyes on a delectable vintage Givenchy coat, complete with matching belt. It’s ultra classic, makes me feel like royalty, and it was 250 euros cheaper than the sleeping bag coat. Granted, they’re totally different, but this has way more staying power in my closet and did I mention the part about feeling like Queen Clarisse Renaldi just gave me a makeover? Sometimes better things do come to those who wait. Before you think “Wow Maegan, you are the epitome of frugality and self restraint,” I need to come clean and tell you, I also splurged on an Isabel Marant blazer and a pretty little blue Céline bag. Yes, I nabbed one with the accent. The Isabel Marant in all her glory. As a homeschooled kid from a large family, thrifting is my mother tongue. Probably always will be. Funny enough, I have to credit my husband with being the one who taught me the language of appreciating the investment pieces. Honestly, that’s another article in itself. 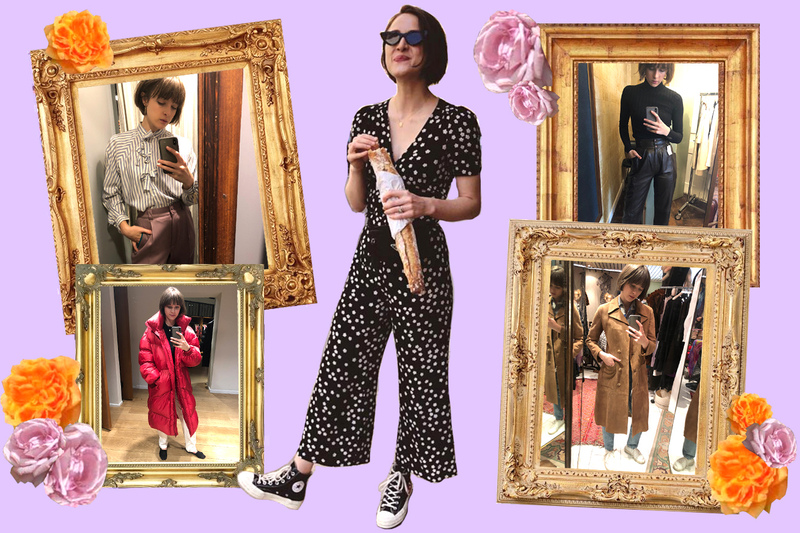 I love hearing people’s approach to how they choose to build their wardrobes. It’s so personal and interesting. I love building a closet full of scores, splurges, bargains, and finds. I learn a lot about myself, collecting wearable evidence of the lessons as I go, or sometimes memories of the ones that got away. Maegan Hall is a world traveling, 20-something ventriloquist — yes you read that right! — and a contributing writer at The Bleu.